By popular request of the AudioValve Fan Community, AudioValve proudly presents a succession model within the Assistent series, the Assistent 50. Here the experience of 10 years production is combined and provides the basics for a completely new technological and optical design. 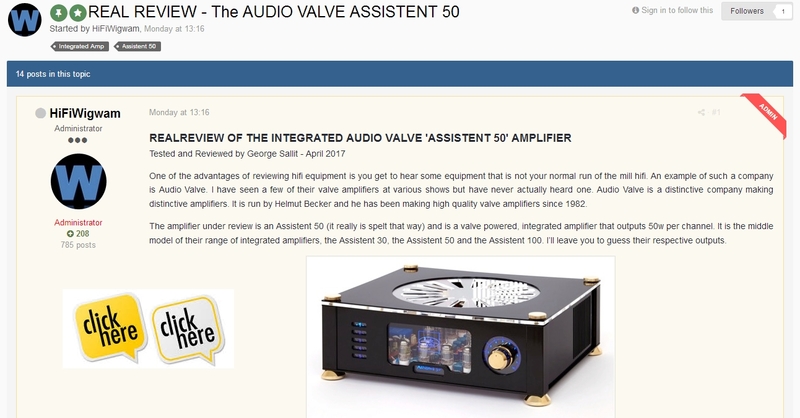 We have to thank you, dear fan community, it is owed to your loyalty to the product that we at AudioValve did not avoid expenses nor troubles to develop a new unit based on the trusted basics, which allows for your demand for „more performance and comfort“. 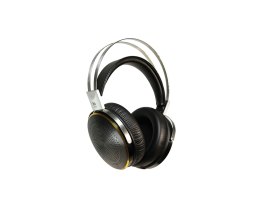 Several reports around the globe document time and time again the excellent sound performance of the sophisticated construction of previous Assistant series. 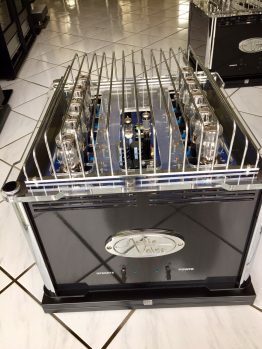 Just like before, today power tubes type QQE are employed, but now 8 tubes – four per channel, developing full 2 x 50 Watts, reflecting a sound transparency that was and still is proverbial for this series. Besides all the technological innovations, especially the casing design offers several surprises. 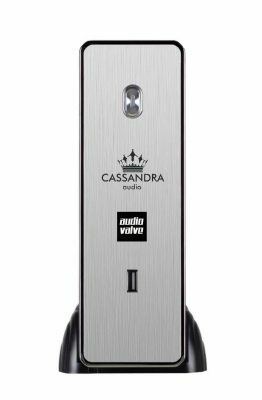 No controls on the front panel, 3D-lasered and lit writing in the amplifier’s transparent front look hardly show, what wave of innovation forms the basis of the product and will give you the expected joy for many years to come. 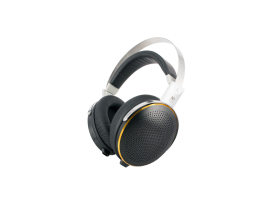 With these features AudioValve without doubt is again trend-setting. AudioValve peut renvoyer au désir multiple de sa commune de fan avec fièrement sur un sous-produit de la série Assistent, le Assistent 50. Dans lui se réunissent les expériences d’une production durant plus de 10 ans et livre la base pour un complètement nouveau design technique et optique. À vous, chère commune de fan, et votre fidélité au produit c` est à devoir que nous n’avons craint aucun effort et frais pour développer un nouvel appareil sur la base éprouvée lequel correspond aussi à votre besoin de plus de performance et confort. Les nombreux reportages autour du globe couvrent sans cesse les qualités sonores distinguées de cette construction polie, raffinée de la série de Assistant. Exactement comme à l’époque, des tubes de power du type QQE entrent en action aussi aujourd’hui, cette fois, cependant, au total 8 pièces – quatre par canal. 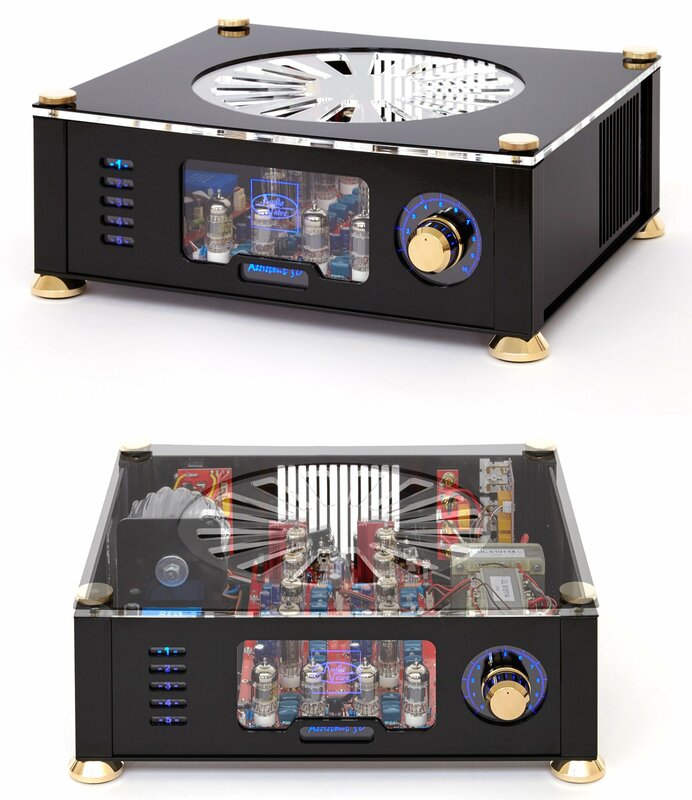 D’eux se développe 2*50 watts rassasiés. Avec cela, ils reflètent une transparence dans l’image de son qui était proverbiale pour cette série depuis toujours et est encore. A côté de tous aux innovations techniques, en particulier l’organisation de boîtier montre beaucoup de surprises. 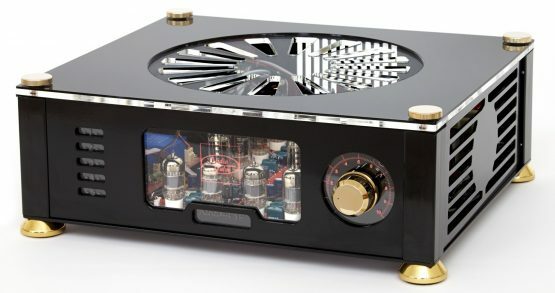 Aucun élément de service sur le front, 3D-lasé traits qui illuminent bleu dans le look de front transparent de l’amplificateur ne révèle seulement dans le commencement quelle poussée d’innovation au produit se trouve à la raison et vous offrira pour beaucoup d’années de joie. A part le bouton de volume l`Assistent 50 d’aucun élément de service supplémentaire ne possède. Le service total se produit au-dessus d’une télécommande sympathique du lourd aluminium, lequel au volume des livraisons de l’appareil fait partie. 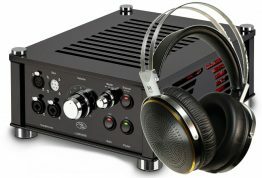 Avec ces signes d’équipement, AudioValve est donc encore dirigeant sans aucun doute. 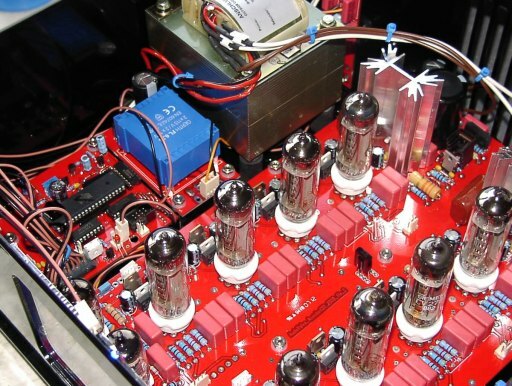 One of the original features of the Audio Valve products is to be found in the utilisation of the valves in such a way that they operate as closely as possible to their ideal reference values each according to its type. One recalls, for instance, the output pentode-triode PCL 805 and most particularly the small beam tetrode with a common cathode QQE 3/12. This valve with a noval (nine pin) base was manufactured formerly by Valvo, Philips and Telefunken etc. (the latter was used in our test amplifier) It has a per plate power dissipation of 7,5 W and may be used with plate voltages ranging from 200 to 300 V. It is ideal in class A and AB amplifiers. This valve, according to Helmut Becker, is ideally adapted to be integrated in a circuit which includes another very innovative concept, an automatically operating grid bias control, refered to as „ABR“ and used to great advantage in the integrated amplifier Assistent – 50. 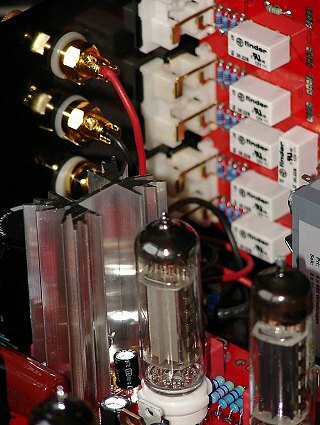 The amplifying circuit uses 12 valves, but the push-pull output stages are coupled to the ABR circuit for each power tube. This exclusive AudioValve feature, allows a comparison of the reference voltage value with that engendered by the quiescent current and which appears at the terminals of a small value resistance in the return cathode circuit. A small operation amplifier monitors, as comparator, the divergence and deliverers the compensation voltage to the grid of the valve. Each valve, young or old, reaching reference values or not is thus compensated in its Grid bias to operate at a value which corresponds to its optimal quiescent currant. A red LED diode, at the foot of each value lights up preventing the use of inadequate or defect valves. 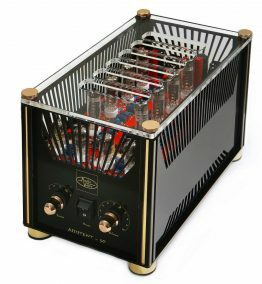 For each channel the input stage and driver stage are served by an almost known noval valve, the double triode ECC 82. The classical chassis has been set into a caisson (a case-like frame). 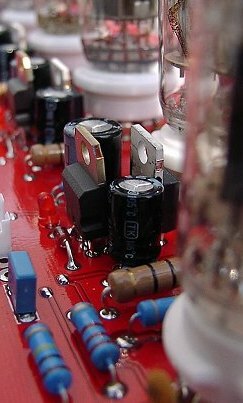 The valves sit in their sockets mounted on a double side printed circuit board. 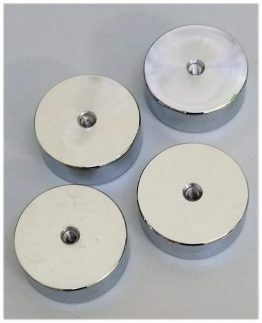 Little columns support the glass cover preventing dangerous hand contact burns or electric shocks could ensue conforming to the CE requirements. The cooling is achieved through the rearsides and topglas. The minimal controls mounted at the front consist of and a volume control the two channels and input selector being coupled in their operation by a remote control. At the back are the cinch input sockets, two pairs of output terminals and a mains switch and connector. TAIWAN TEST – please click …. – Make sure that the batteries are fitting tight at their place. – On the back side of the remote through a little hole you can see a blue LED .Located on the PC board of the remote. – Now press at the same time the volume up and down button together, untill the LED flashes, then stop doing so. – 2 times for the EKLIPSE and 3 times for the ASSISTENT 50. – You can change the program of the remote by pressing the buttons of the volume, untill the LED is flashing as much as you need to be the correct program.